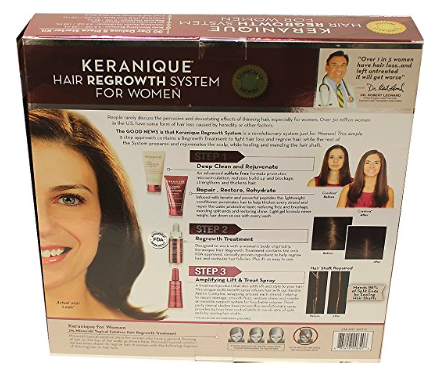 Home » Hairloss Restoration for Women » Keranique Complete Hair Regrowth System » Keranique Hair Re-growth System Review – Is This a Safe Treatment? Maybe or Not! 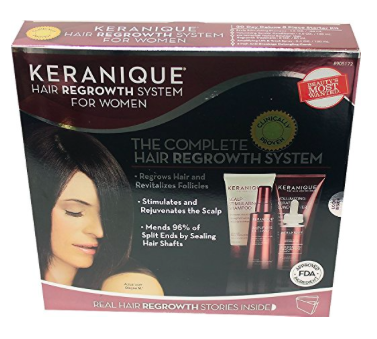 What is Keraninique Hair Re-growth System ? Keranique® is a brand for a line of products that promotes to offer over-the-counter remedy to thinning and female pattern baldness. 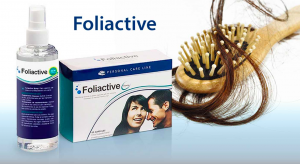 The manufacturer claims that their hair re-growth system is clinically proven and the only FDA approved hair loss solution for women. The formula is said to be recommended by Dr. Batra, M.Sc., M.P.H, and M.D. Board Certified Dermatologist. Describing hair loss as a natural part of the aging process, Keranique claims that their treatments thicken existing hair, fortify follicles and encourage hair re-growth within 120 days of proper use. I can now see the manufacturer’s reason for promising to offer a 120 days money back guarantee to any customer. Of course, this is enough time to give this re-growth system a shot, but the big question here is; will it leave up to its claims and promises? With reference to the manufacturer’s description, women using Keranique will get a thicker, fuller and a healthier looking hair in three (3) ways. That takes us to each one of its brand. 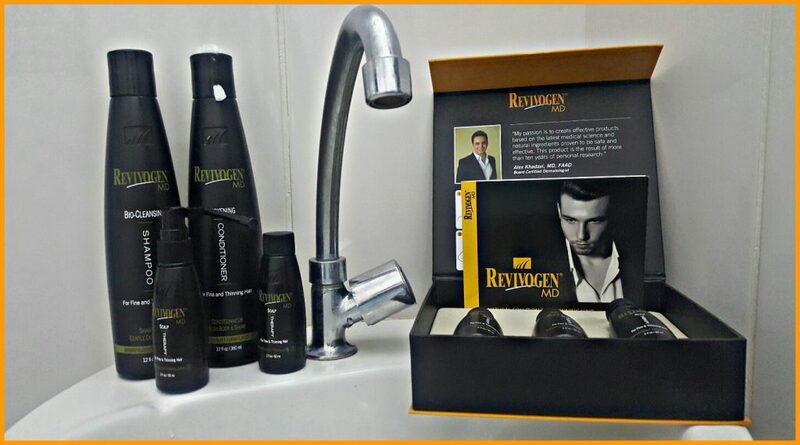 Undoubtedly, thinning hair as well as hair that break or split will definitely need a shampoo and a conditioner formulated to address the condition. The Scalp Stimulating Shampoo and Volumizing Keratin Conditioner is said to work together to remove build up and reinvigorate the scalp. The formulas also condition and penetrate the hair strand to thicken, strengthen and help repair the hair shaft while reducing frizz and breakage. According to maker, the re-growth treatment is specifically designed to work with the body chemistry of women. 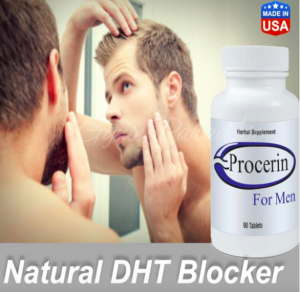 It promotes to contain the only FDA approved and clinically proven non-prescription ingredients for the purpose of re-growing the hair and revitalize the hair follicles. Keranique Regrowth Treatment is said to incorporate a patented easy precision sprayer designed to completely target the thinning areas. This, according to the product manufacturer makes it easy for use. This promotes to be a combination treatment and a styling product that adds lift and style to a woman’s hair while protecting the hair. It is said to be a unique heat activated spray. It should protect the hair against damage from styling tools and environmental factors, infuse the hair with the proprietary Keratin Amino Complex™, repair damaged hair, restore shine and ultimately create a support system for a touchable hair volume. According to my research and findings, a third party clinical study is said to have proven that this formula gives 24 hour frizz control and amends 96% of split ends by sealing the hair shaft. Who Can Use Keranique® ? Going by the details obtained so far, Keranique® is designed to address thinning hair and pattern baldness in women. This simply means that women who want to stop their hair loss and grow a thicker, fuller and healthier looking hair can use these hair products. Their company mentions to have carried out a third party clinical test with the products in females between the ages of 35-60. Hence, it is not for folks who are below the age of 18. The formulas should not be used to diagnose, treat, prevent or cure any existing disease condition. The manufacturer’s profile is lacking. The manufacturer of Keranique® brand seems to be very confident in the products by giving a policy stating that women who are not convinced by the results can ask for a refund within 120 days of purchasing the formulas. As mentioned in the products’ official website, the shipping and handling fees are not refundable. Users of Keranique products should get a welcoming customer service. The Frequently Asked Question section in the products’ official website will also help to solve many inquires by customers. They offer replacement for damaged products and discrete shipping of purchased items. They offer other bonus packages and gifts. Users of the product can get in touch with the company through their contact information in the products’ website. Keranique as we have seen claims to be the ultimate hair re-growth system for women who are experiencing thinning hair and pattern baldness. It states to be clinically proven and recommended by a medical expert. This could be true, but side effects are possible. On the other hand, a good number of women who used the formulas in the past made a lot of negative complaints in different known retail website, especially here on Amazon. On Amazon, you can see what customers are saying about their before and after results ! This is really serious and could mean that the manufacturers have a skeleton in the cupboard. The third complaint nullifies the claim that Keranique® gives result in 2-4 months averagely. It might interest us to know that the hair treatment contains minoxidil of which the price of the formula is higher than raw minoxidil in the market. With all these said, I will not advice any woman with alopecia to use Keranique® treatment system. I would go for something better such as the Watermans Luxury Hair Growth Shampoo and Conditioner. 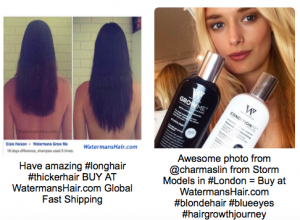 By click here, I’m going to show you before and after photos from the previous users of the Watermans Luxury Hair Growth products. Don’t miss out! So do have any concerns? Feel free drop them below at this review ! Previous Post The Rebuild Hair Program Review – Does The Rebuild Hair Program Pdf Work? Only Here!